To celebrate Dogwoof's Planet of Snail DVD give-away here at The Totality, I'll be spending looking at, and celebrating, several of the titles available in their catalogue over the course of this week. Today I start with The First Movie - an incomprehensibly magical documentary by everyone's favourite film historian Mark Cousins. For many of us it's impossible to remember, or even comprehend, what the first movie we may have ever seen could be. We take cinema, and it's ability to transport us, to make us laugh and to summon tears from our eyes, almost entirely for granted - films have always been part of our lives and it's entirely impossible to imagine life another way. Even the most jaded of movie-goers must remember a time when the moving image was enough to inspire transcendental glee; for many of us, sat in front of the big screen and following the adventures of our heroes, be they Phil Connors, George Bailey or Rick Blaine, is enough to inspire an unparalleled nostalgia and warmth in our hearts. To the more fanatical of movie fans these same instances can be eulogised as some of the best moments in their lives, unmatched moments of joy and empathy. Imagine, then, a world with no cinema. A childhood spent without the ability to escape the occasional mundane Sunday with a trip to the movies, a voyage to a world completely unlike your own; the worries of forgetting to do your homework swapped for the more pressing concerns of whether or not Jackie Chan can overcome even higher surmounting odds - he can't possibly have survived this fall can he? A world with no cinema is the starting point for Mark Cousin's magical realist documentary. On a trip to Iraq, the director sets up a tent to show these children the first moving images they will have ever seen. Their life, normally spent in the horrors of a deeply war torn region, is interrupted by tales of aliens visiting the earth in E.T. and of the story of a boy and a balloon with a mind of it's own in Le Ballon Rouge. Cousin's gives these children the gift of cinema and it's impossible not to see their internal reactions spread all over their face - wonder and inspiration have imbibed their souls in equal measure. The real majesty of Cousin's documentary comes next when, bequeathed with their new knowledge of film as a medium, the director arms the children with video cameras to go away and make their own movies. Just because they've never experienced the medium of cinema before does not mean that the children are lacking in imagination - indeed, they all seem to possess an innate ability for story-telling and, as Cousins' so eloquently puts it, they each understand their new equipment as being "empathy machines". None more-so perhaps, than the child who decorates his own attempt at a movie with a live action voice-over. Another child is making shapes in the earth as the first time director narrates, poetically, that the traced fingers represents the boy giving his dreams to the ground. That this line came from a young child is startling but shows that, in us all, is a deep sense of empathy and wonder which can oftentimes be most easily tapped into viewing the world through the fantasy of movies. 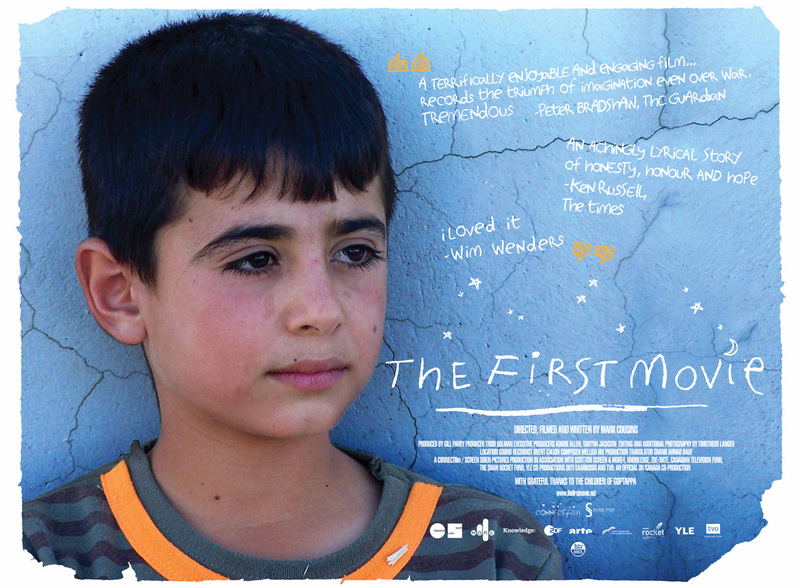 In The First Movie Mark Cousins gives Iraqi children the incredible gift of the experience of cinema. The children, with their first experience of film, in turn give us the incredible gift of this movie. Watching them observing cinema through naive eyes transported the writer to an imaginary place where he too could imagine viewing film for the first time. Cousin's film is one which alerts the audience to feeling young and live - it's cinema of the most pure and magical kind.